Stronghurst:"It's been a significant year for us at West Central," Board President Lonnie Brent said to those in attendance at the first public progress update since the school opened this fall. 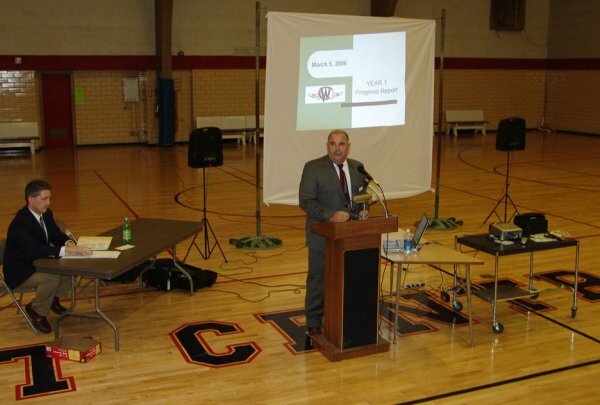 "We've had some challenges, some surprises, and some frustrations," he said, but we have faced them, "and we will continue to fine tune those things to be one of the finest districts in West Central Illinois." One of the enhancements has been a West Central website Brent is particularly proud of which has had over 30,000 hits, he said. The site offers school schedules, lunch menus, activities, board meeting dates, the minutes, and results of each board members vote on issues as well as other pertinent information. "All the decisions have been made in the best interest of the students, the staff, and the community, and that will continue to drive us." Paul Anderson (present), with Brad Arnold and Richard Clifton absent. Brent said they have received lots of help from Teresa Adair, Jeanne Serven and Barb Sprietler. Many issues were discussed during a power point presentation by Mr. Grimm. Among them were the 177 certified staff it takes to run the school. of which 160 are full time workers. The cooperative effort was explained for pooling resources with other schools to meet the needs of the Special Education students. It was explained why the $500,000 modeling was done on the Jr. High building closing down the upstairs rooms due to the large expense of bringing the building up to code. With the change of a new district, the former grandfathering in of school codes were no longer in effect. The Media building was also kept open for similar reasons. "We had no additional space to house those programs (Pre-K and Even Start)." Grimm said they will be asking the board to seek a grant that will allow all 3 and 4 year olds to come to Media for a 2 1/2 hour learning session not just those with special needs. Declining enrollment was discussed and the financial effects when they lose students or when students do not attend school. He said they are down 36 students since the beginning of school with 27 of them from the high school, none from the junior high school. West Central today has 1,001 students and in a 5-year projection, Grimm expects a 4% drop in enrollment from 1026 to 980. As a note, Grimm said the Committee of Ten had similar projections of 1023 to 977 in 5 years. How long will our board be able to operate without financial hardship? Grimm said, "We will work very hard to live within our means and to provide what is needed for our children's education." Grimm said, they also have been working very hard on a District Crisis Management Plan. Title I program revision and implementation. EDUNET initiative with Carl Sandburg College offering dual credit classes at very little expense to the district. Internet connection was provided at no cost to the district and district residents can also be connected if they let the school know. Staff development is ongoing with department meetings in progress. Grimm said the Budget is the district's "best guess what we will do 12 months into the future. For those who like to keep score, the expenses are running at 58.5% ahead and the revenue is running ahead. The spring legislative session will tell the tale on much of the financial climate. Grimm explained some of the issues with taxes, a tax levy, the lag in payments and the question about reassessment of farmground and timber and Illinois Bulletin 810. He said farm ground for the 1st time in 25 years, will be assessed differently. Grimm also reported on the 3 year teaching contract that was signed with teachers. $28,000 is the beginning salary, he said, pointing out that competitive salaries need to be offered to draw the better teachers. In transportation, Grmim said they have continued with the same busing, owning, and maintaining the buses at the west campus and contracting out for the south campus. The earliest that a student is on the bus is 6:55 and the latest is 4:25 with the West Central Transportation. and with the South transportation the earliest is 7:07 and latest 4:15 p.m.
Students will be taking the ISAT exams next week and are preparing for them, and later will be taking the Prairie State Achievement exam in April. Grimm said that class sizes have stabilized and they now have a sufficient number of students to offer extra courses. Many students are earning college credits through Carl Sandburg College. It has been a way to expand the curriculum without expanding the staff. West Central is very glad to be offering more extra curricular activities. "So where do we go from here to be the best we can be?" Grimm said. In the elementary they are implementing a direct reading program with a goal to reach 120 minutes of reading. In the Junior High they are changing the idea of being a "mini high school" to a school that can develop students socially, physically, and educationally to be emerging young adults by the time they reach high school. At the high school, the selection of key crisis strategies are to be implemented; improvement of student motivation and attitude; review of course sequencing in core areas; and review of the block schedule. They have worked on staff development, completion and acceptance of a staff evaluation plan. Grimm and the board plan on making West Central a lighthouse school that will draw students here which will bring more dollars and allow for more programs. In the education process, Grimm said, all involved should be treated with dignity and respect and we must all remain focused on teaching and learning. The session concluded with a question and answer period with questions ranging from an expanded parking lot, the grading scale for those in honors programs, and the 8 block system to name a few. West Central Superintendent Ralph Grimm gave a thorough overview of the school's progress thus far in its first year of consolidation. The presentation was held during a public meeting at the South Campus gymnasium Sunday, March 1st lasting nearly two hours. Board President Lonnie Brent seated at left, welcomed around forty who were in attendance and gave a short update, then helped field questions with Mr. Grimm afterwards.